Today’s workplace trends are now looking toward taking care of the employees as a means of driving workplace productivity and happiness. Evidence has established a strong connection between employee satisfaction and output, and companies across the country are investing in renovating their structures in order to promote the most productivity while keeping each worker motivated and happy. The design of your business interior is one way improve the flow and aesthetics of your office, and our commercial drywall company is here to help. Since 1999, AZ Drywall Finishing has focused on delivering the best possible outcomes for each of our clients. From framing to painting, our drywall finishers can provide the comprehensive services your business needs to create lasting benefits for your building. Improving employee satisfaction is a great vehicle for gaining more success as a business. One excellent approach that can provide long-term benefits for your workers is updating the design and layout of your space. Today, we’ll conclude our discussion of workplace design tips to improve productivity. If you’re in need of a team of the most qualified drywall contractors in Chicago, be sure to contact us today for a quote! While collaboration and teamwork are needed for success, studies have shown that companies who do not provide enough privacy for their employees suffer from a few setbacks. Providing private space for your employees to speak freely and exchange ideas can produce much better results when compared to open workspaces where scrutiny can come from anyone that overhears a conversation. In these places, employee satisfaction and output begin to suffer. Providing a quiet space for your employees to work in addition to relax can help to minimize distractions, lessening the hectic pace often experienced with open-space floors. It’s important to be mindful when designing the layout of your office space. Employees often thrive with privacy, so be sure to efficiently utilize your space to limit the chances of distraction. Different job positions may require different workspaces, so be sure to create a plan that conforms to everyone’s needs for an optimal outcome. Flexibility is another component here, as employees often enjoy being able to utilize their space in a number of ways. From customizable office spaces to sit and stand desks, there are many ways that you can provide flexibility in addition to privacy for your workers. Our drywall installation experts can help you to create a dynamic floor plan that is spacious and private. Providing outside views. Eye strain in the workplace is a serious concern with today’s abundance of technology, and providing windows can help by giving your employees a chance to rest their eyes. Providing stimulation. A lack of sunlight may tell your brain it’s time to take a nap, which can be very disruptive for your daily productivity. Beyond recovery from eye fatigue, outdoor views can also help people to feel more alert and energetic. 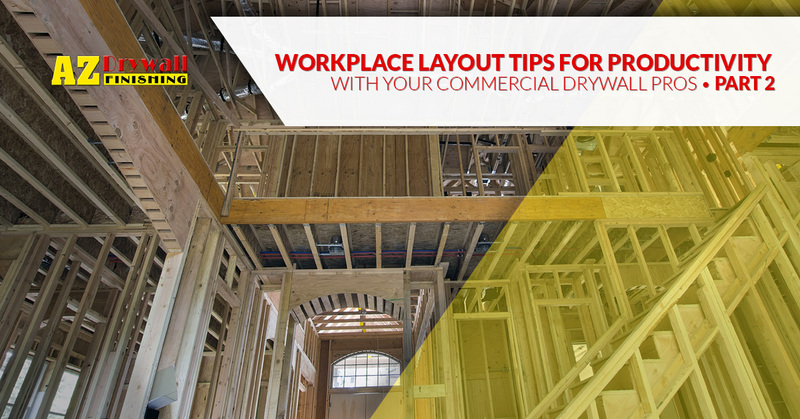 Beyond the physical layout of your commercial drywall, you can also enhance the aesthetics of your space by focusing on the design of the space. Companies that provide blank white walls for employees and guests can expect to suffer from workplace productivity when compared to businesses that personalize their space for comfort and professionalism. Office design. Choosing the right colors and artistic elements for your office interior can help to boost productivity. In many cases, artfully decorating your workspace can also enable employees to think more creatively. In either case, an improved interior design can boost everyone’s morale. Personal space. From hanging family photos to personalized coffee mugs, it can help boost employee productivity when you allow people to bring in their own property. These items can help workers to feel more at home, enabling them to work with more motivation. The design and layout of every company is unique, drawing on the needs and nature of the job to dictate how the space should be laid out. One of the best ways to improve the work experience for your employees is to ask for their thoughts and feelings on the subject. Even if you work closely with your personnel, they may have unique insights that can result in long-term benefits for everyone in the office. By focusing on the employee’s needs and wants in workspace design, you’re ensuring that your workers will be happier once the renovations are finished. This increase in morale should signal a marked increase in productivity and employee retention as well. Investing in the happiness and satisfaction for your team can result in major benefits over the long run of your business. It’s to create a space that employees will love, as happier workers tend to result in more workplace productivity. If you’re looking for assistance with installing drywall in a smart and reliable manner, AZ Drywall Finishing is here to help. Our commercial drywall contractors in Chicago can create amazing layouts for your office, resulting in daily benefits that will make your investment well worth the price. Contact us today to learn more about our drywall company or to receive a quote for your project!